Aw, you sunk my battleship! Milton Bradley’s classic board game, Battleship, can now be added to the roster of fun, creative ways to commit the Periodic Table of Elements to memory. Karyn Tripp, a homeschooling mother of four, was inspired by her eldest’s love of science to create Periodic Table Battleship. I might suggest that the game is of even greater value to those who don’t naturally gravitate toward the subject. Faced with the option of learning the elements via shower curtain or coffee mug osmosis, I think I’d prefer to take out an opponent’s submarine. The winner is the player who wipes out the other’s fleet, though I might toss the loser a couple of reinforcement vessels, should he or she demonstrate passing familiarity with various metals, halogens, and noble gases. Fasten two Periodic Tables to each folder, facing the same direction. Prop the folders up with books or some other method to prevent opponents from sneaking peeks at your maritime strategy. When a turn results in a miss, put an X on the corresponding spot on the upper table. When a turn results in a hit, circle the corresponding spot on the upper table. Continue play until the battle is won. Repeat until the Table of Elements is mastered. Supplement liberally with Tom Lehrer’s Elements song. 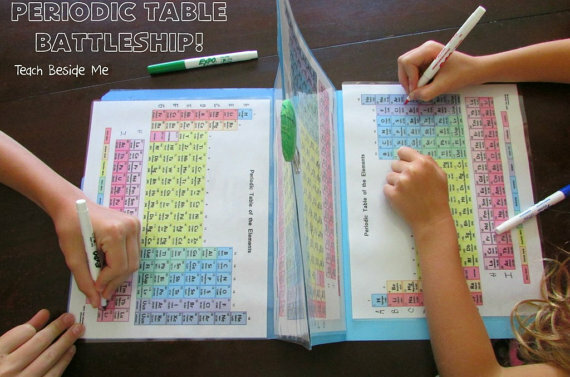 Those not inclined toward arts and crafts can purchase a pre-made Periodic Table Battleship set from Tripp’s Etsy shop. Ayun Halliday is an author, illustrator, theater maker, secular homeschooler and Chief Primatologist of the East Village Inky zine. Her play Zamboni Godot is opening in New York City in March 2017. Follow her @AyunHalliday.